Bobcat sightings are increasing in Ohio and the Scioto Brush Creek watershed. These elusive native cats were extirpated from the state by 1850. It wasn’t until the mid-1900’s that bobcats began to return to Ohio’s forests. Outdoorsmen and nature enthusiasts are capturing the bobcat’s image on game cameras more frequently over the past few years. The Friends of Scioto Brush Creek, Inc. would like to invite everyone to join them for a community gathering and program on the wild cats of the watershed on Saturday, February 17th at 10 a.m.
Their guest speaker will be certified wildlife biologist, Cheryl Mollohan. Cheryl volunteered from 2012-2015 with the Ohio Division of Wildlife, on a bobcat research project with Dr. Suzie Prange. 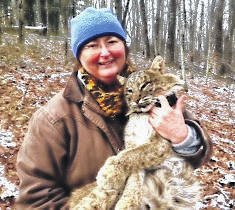 11 different bobcats were captured in Vinton County and fitted with radio collars. Cheryl will share her knowledge and experiences working with female bobcats, kittens and habitat selection. She’ll also update on the current status of mountain lions in Ohio. McAllister continued, “This is the 20th anniversary of the Friends of Scioto Brush Creek, “We have been here from 1979 to 2017, we are going to have a presentation over the 20 years’ history and the projects and things we’ve accomplished over these years. We’ll be showing our educational programs, things like that. This will be followed with a pot luck luncheon and anyone can bring a dish and join in the luncheon. Some people will just come for the program and leave and that is fine, also. When asked the question, are there bobcats here? McCallister said, “Absolutely, we are getting reports from hunters who see them in their tree stands and they are actually capturing them on their video cameras.” She also stated that on their website, she has a video from a hunter’s tree stand, where he captured on video the bobcat just walking around. She said that she and her husband saw one cross State Route 73, near Daniel’s Greenhouse. 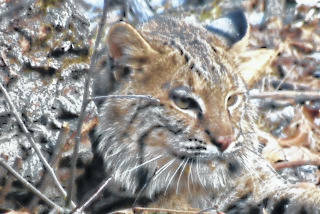 She encourages the public to visit the website and post when and where you have seen bobcats. Imagine driving in rural Scioto County and right in front of your car, is a full fledged bobcat, and not the mascot of Ohio University, the real bobcat of Ohio! Program for FOSBC: What: The Friends of Scioto Brush Creek’s Annual Community Gathering and Covered Dish Luncheon. Please bring your favorite dish to share. When: Saturday, February 17th begins at 10 a.m. Where: Union Township Community Building, beside the Union Township Volunteer Fire Department, (right there at Lombardsville) across from the old school, 50 Arion Road. Parking and meeting room entrance at the rear of building. The Friends of Scioto Brush Creek, Inc. is an all volunteer organization whose mission is to maintain and improve the water quality of Scioto Brush Creek through education, awareness and involvement of local residents. Contact Jody if you have questions at fosbc@scpwildblue.com or 740-493-3062.